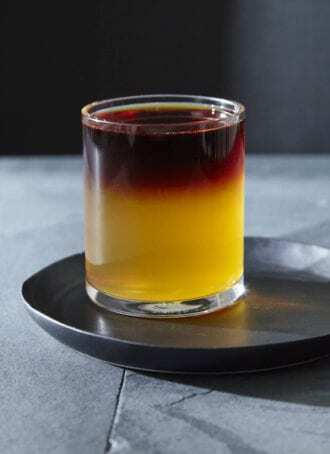 Referencing the light and dark sides of the force, this cider cocktail from Star Wars fanatic Jesse Card finds perfect balance through a combination of molasses-rich blackstrap rum and a snappy, semi-dry cider. Combine the rum, falernum and lime juice in a mixing glass with ice and stir to chill. Pour the chilled cider into a rocks glass, then with the back of a barspoon, slowly float the rum mixture onto the top of the cider. Squeeze the orange peel over the drink to express the oils, then discard. Garnish. From Tasting Cider by Erin James. Copyright 2017, Sip Publishing. Reprinted with permission from Storey Publishing. This Sidecar riff is spiced with cardamom and brightened with kumquats.